Bongongo Angus – Where All Blacks run in Wallaby country! Over a third of this sale group are sired by CLUNIES RANGE LEGEND NBH L348 and are worth your attention. Selected as an AI sire in 2016 his progeny are impressive and so consistent. We are very pleased to be offering this large group of outstanding bulls by this highly regarded sire. The Breedplan EBV’s across this cohort are so similar and backed up by excellent structure, temperament and great phenotype. 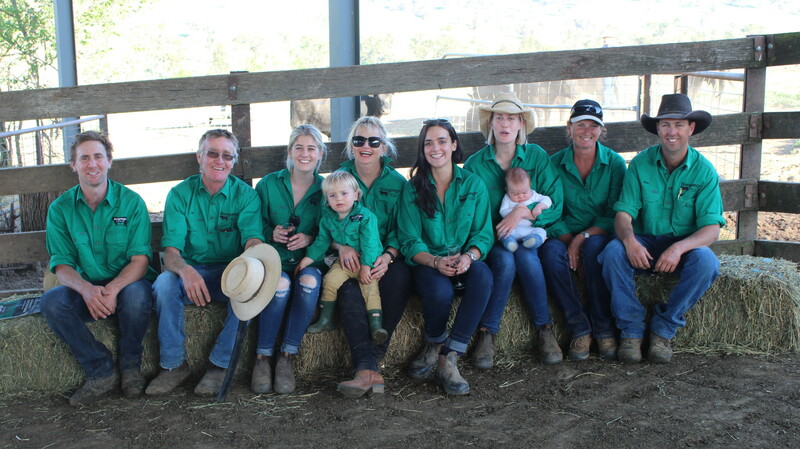 This is the 93rd year of the Graham family breeding Angus cattle at Bongongo. Our stud is one of the oldest performance tested herds in this country. We source proven and high performing Angus sires to keep improving our genetics so this flows on to our clients herds. With our strong veterinary background and love of genetics AI and ET are used extensively in our herd. Our autumn Bull sale on Monday 20th May will be by the Helmsman auction system. This system combines the best features of an auction system and sale by private treaty. You have more time to consider lodging your bid. You can place genuine bids on any bull of your choice at any time during the sale period. You have the opportunity to reassess each lot during the sale without any pressure to make an instant decision. You can take home the bull you want, irrespective of the lot order. If you are considering buying a number of bulls you will have a better chance to average your purchase costs in order to meet your budget. People say that the Helmsman system is buyer friendly because it helps them get better value for money. The simultaneous auction method enable them to switch to the best valued animal at any time during the sale. * Large emphasis on mature cow weights (MCW) is critical to our philosophy to drive the cost of production lower for not only our herd BUT that of our clients too. * High emphasis is finally on carcass traits with marbling (IMF), positive fat cover and high muscle area (EMA) which has been a major focus of ours for nearly three decades since ultrasound scanning began. Positive fat cover in this tight (drought) year cannot be overstated and marbling in the Bongongo herd is one of the best in this country. All this contributes to sale bulls with excellent breed indexes. We look forward to seeing you on sale day and we are always interested in your feedback. Please don’t hesitate to contact Bill 0428245208 or Tom 0422050019 to arrange an inspection or to discuss your requirements. If you have a problem with any of our bulls please call us ASAP. We pride ourselves on our after sales service! Please join us for a complimentary morning tea and BBQ lunch. For the last three years we have decided to use GENOMIC testing (Zoetis i50k test) to enhance our EBV accuracy and check the parentage of all our sale bulls. This is a great advance to develop our Breedplan EBV’s into an even better world leading program. At Bongongo we understand the key profit drivers of our commercial clients with fertility the most important. The Bongongo bulls are given rigorous pre sale Veterinary Breeding Soundness Examination (VBBSE) followed in subsequent years by an annual VBBSE where possible. This should be a sale industry standard to maximise bull fertility and protect buyers from poor reproductive performance . Our bulls are sold in their “working clothes”. They are not given any special treatment which we believe prepares them for the conditions under which they need to perform. Our bulls are bred for the commercial cattleman and our stud herd is run under strict commercial conditions. Selection for fertility is matched by those Breedplan EBV’s that affect this trait especially calving ease, gestation length, importance of positive rib and rump fat (as proven by the CRC project) to aid selection of AI sires used in the herd. These sires tend to complement the key research from the Beef CRC Maternal Productivity project released proving the importance of higher rib fat depth heifers. They have up to 8% better conception rates compared to those with lower RIB FAT EBV’S. This supports what has been obvious to me for years standing behind many females. It is more obvious in the tougher years and equates to the critical importance of fertility (reproductive rate) and its effect on your enterprise profitability. It was also pleasing to note that selection for higher EMA had no effect on heifer conception rate. 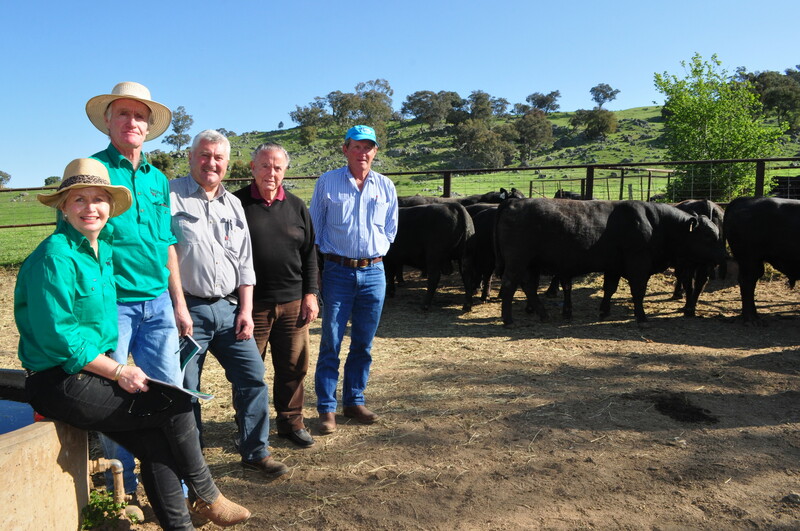 Buyers of equal top price bulls at Bongongo Spring sale 2015 Renato Gaspari Coots Creek Angus Yass and Paul Ferry and Garry Williamson Abingdon Station Nangus with Shauna and Bill Graham. Photo Cara Jeffery The Land. The emphasis at Bongongo has always been in the strength of the female herd. They are our backbone. Bongongo females have been carefully selected for fertility, milking ability, structural soundness and length. The progeny of these cows are today in high demand by feedlots for steer calves plus commanding premium for surplus female lines. Not much has changed in 38 years as a cattle veterinarian as fertility remains the key profit driver in your cattle breeding business and matching your herd to your environment is critical. The importance of genetic diversity in the Bongongo Stud is well recognised especially with our veterinary training to limit the impacts on future production due to inbreeding. The effects of recessive genetic traits especially AM, NH & CA and recently DD bears testimony to the dangers of the reliance of using the genetics of some bulls too heavily. The ability for breeders to select for key traits through scanning has been the single biggest development over nearly 30 years giving breeders an enormous benefit for carcass selection traits. Leading Angus sires who fit these criteria are used extensively through artificial breeding to improve the genetics of our herd and our clients herds! The importance of MARBLING(IMF) is back on the agenda as the red meat sector moves through genetics and nutrition to supply improved eating quality and increased value down the chain. The consumer is becoming more educated, demanding and able to afford and our breed is in a tremendous position to take advantage of their requirements. We have a selection of both Stud and Commercial Females for sale now. We welcome private Bull sales. Please contact us for details!